Robert Sargent Shriver ’38 LAW ’41, a pioneer for public service who revolutionized community participation in America as a founder of the Peace Corps and the Special Olympics, a 1972 vice-presidential candidate and a Yale Daily News Chairman, died Monday afternoon at Suburban Hospital in Bethesda, Md. He was 95. Shriver, known as “Sarge” to his friends and colleagues, endeavored to change the world through social activism and global service. Throughout his many projects, which ranged from editorializing about the New Deal and the importance of benevolence in the pages of the News in 1938 to leading President Lyndon B. Johnson’s “War on Poverty,” Shriver was resolute in his dedication to improving the human condition. Before a group of eager, aspiring journalists at the 1967 Yale Daily News Banquet 25 years after his own graduation from Yale, Shriver spelled out this vision. He pointed to pressing social problems facing the students in the audience in the turbulent 1960s, including a failure to direct spending towards humanitarian and social improvement — some of which seem all too familiar more than 40 years later. Family, friends and colleagues interviewed said that Shriver devoted his life to answering that question. The future social activist was born to a Maryland-based Roman Catholic family in 1915. The Shriver family, whose ancestors signed Maryland’s Constitution and Bill of Rights in 1776, moved to Connecticut during Sargent’s early adolescent years. His childhood was marked by constant financial struggle, said his son, Robert Shriver LAW ’81. Shriver attended the private Canterbury School in New Milford, Conn. on full scholarship before moving to New Haven for a seven-year stint at Yale, where he earned a bachelor’s degree in 1938 and a juris doctor at Yale Law School three years later. In fact, it was his then-paying job as Yale Daily News chairman that helped him pay for his education. At Yale — and specifically at the Yale Daily News — Shriver laid the groundwork for his later career in a series of politically-minded editorials. The topics of his writings were varied, but each piece emphasized the power and importance of an individual’s actions. Shriver used elements of this argument in articles about pre-war propaganda, the importance of charitable donations and how students were obligated to glean as much as possible from their Yale educations. Shriver reguarly questioned authority and promoted the need for public service in these articles, and during his tenure as the 1938 chairman of the News — a prominent campus post — he became known for his vocal support of the liberal New Deal programs created by the Roosevelt administration. As an undergraduate, Shriver developed a passion for public and giving while immersed in what he described as a likeminded group of students. Shriver’s influence at Yale extended far beyond the News. He was also a Delta Kappa Epsilon brother and was tapped to join secret society Scroll and Key during his senior year. As a prominent campus figure, classmate Collister Johnson ’39 said Shriver’s charisma and misson were clear. “He was a great, great guy, really a leader while he was at Yale,” Johnson said. 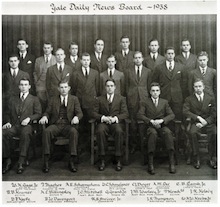 Upon graduating from Yale Law School in 1941, Shriver began his career in public service and enlisted in the Navy for five years during World War II. Initially an opponent of war, Shriver enlisted in a show of support for his country. He saw combat as a gunner in the Battle of Santa Cruz and the Battle of Guadalcanal, and later served as a torpedo and gunnery officer on the USS Sandlance. After he left the armed forces, Shriver began working for John F. Kennedy’s father, Joseph, at his financial firm, JPK Enterprises. It was during his time at the company that he met Eunice Kennedy, whom he married in May 1953 after a seven-year courtship. The couple had five children: Robert, Maria, Timothy, Mark and Anthony. Shriver soon entered into an emerging family business: politics. He coordinated brother-in-law John F. Kennedy’s presidential campaigns in the Wisconsin and West Virginia primaries, and he led the committee that searched for administrative and ambassadorial candidates in Kennedy’s administration after his victory in 1961.Shriver also convinced Kennedy to contact Coretta Scott King, wife of Martin Luther King Jr., while the civil rights leader was in jail in Georgia. Though initially viewed as risky for Kennedy, the move paid dividends in support for his candidacy. But despite his involvement with the high-profile campaign, Shriver may be best known for founding the Peace Corps in 1961. He did so at Kennedy’s request, and in an effort to fulfill a campaign promise to create a service corps. When Shriver stepped down as director of the program in 1966, the Peace Corps had placed over 15,000 volunteers in locations around the world. To date, the program has never seen as many participants as it did then, according to the Peace Corps website. “In the Peace Corps, in the War on Poverty, we’ve learned that the challenge before America today is not to become richer or bigger or stronger, but to become more human,” Shriver said in an Oct. 4, 1967 speech at the University of California, Berkeley. Despite the success of the Peace Corps, Shriver did not rest on his laurels. Mickey Kantor, a United States trade representative from 1993 to 1997 and United States Secretary of Commerce from 1996-’97, first met Shriver when the two worked together to found the Legal Service Corporation — a non-profit corporation that provides civil legal help to poor Americans — in 1974. “[Sargent’s and Eunice’s] watchword was not what you did yesterday, but what you are going to do today and tomorrow,” Kantor said. He served as the first director of the Office of Economic Opportunity (OEO) from 1965 to 1968, the bureaucratic organization designed to wage Johnson’s “war.” In this capacity, Shriver founded a myriad of social outreach programs including Volunteers in Service to America (VISTA), the Community Action Program, Job Corps and Head Start. During his tenure as director of the OEO, Shiver also founded the Sargent Shriver National Center on Poverty Law — formerly known as the National Clearinghouse for Legal Services when it was founded in 1967. John Bouman, current president of the Center, said Shriver was adamant that poor communities be able to participate in policy conversations and important public decisions and designed the center around this goal. But not all of Shriver’s public service projects were governmental in nature. He and his wife, Eunice, orchestrated the first official Special Olympics games in July 1968. The program grew out of a summer day camp Eunice started for children and adults with intellectual disabilities at the Shrivers’ own home in Maryland in June 1962. Jamie Kirkpatrick, who worked closely with Shriver from 1984 to 1989 in expanding the Special Olympics, said he traveled across the world with Shriver to organize and create new programs. Kirkpatrick said Shriver was completely devoted to helping others, especially the disadvantaged. Throughout Shriver’s crusade against deprivation and discrimination, those close to him were amazed by his seemingly boundless energy. Craig, the former White House counsel, said Shriver had an immediate impact on his life when Craig’s father left his position as a dean at Stanford University for the Peace Corps in 1962, where he served as the organization’s first director of training. As the 1960s gave way to the 1970s, Shriver’s role in government began to evolve. His experiences as a bureaucrat eased his transition to a two-year turn as the United States’ ambassador to France, where he lived from 1968 to 1970. Though relations between America and France had grown strained in recent years, Shriver was determined to improve ties between the countires, and he eventually won the respect of the French. His successes abroad raised his political profile and caught the eye of Democratic presidential candidate George McGovern. He selected Shriver as his running mate in 1972 when Missouri Senator Thomas Eagleton resigned from the ticket. McGovern and Shriver did not win the election, but McGovern joined the long list of Shriver’s admirers. In 1976, Shriver made a bid for the Democratic presidential nomination, but did not make it past the primaries. Despite the high-visibility of his electoral losses, Shriver’s defeats were not central to his career. His son Robert said his father was always a “social activist, not a politician” at heart. Shriver resigned his active role in the political arena and moved back into the private sector. From 1971 to 1986, Shriver worked for Fried, Frank, Harris, Shriver & Jacobson, a Washington-based law firm. Following his retirement, he remained active in Special Olympics leadership until 2003. Sargent’s wife Eunice died at the age of 88 in 2009 after suffering multiple strokes in previous years. 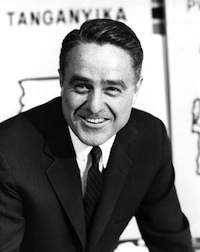 A vibrant and charismatic public figure, Sargent Shriver also had a private side, deeply rooted in his Catholic faith. Fitzpatrick fondly remembered an encounter with Shriver’s faith during a trip to Seoul, South Korea with him. Politicians and political experts said Sargent Shriver’s example of enthusiastic service and dedication to the nation still resonates in the academic and political world today. David Gergen, a senior political analyst for CNN and a professor of public service at Harvard’s Kennedy School, said it is fitting that Shriver died so close to the 50th anniversary of President Kennedy’s inaugural address, which will be celebrated Jan. 20. “[The speech] ushered in a new form of American idealism, and he really was the ideal of that,” Gergen said. As influential as Sargent’s work in American government has proven to be, his collaborations with wife and fellow philanthropist Eunice have had a lasting impact. According to statistics from the organization’s website, Special Olympics now has more 300 million athletes from over 150 countries participating in the program. Both Sargent and Eunice won the Presidential Medal of Freedom, an award created by President Harry S. Truman in 1945 to honor exceptional civilian service. In the future, friends and colleagues said Shriver will be best remembered for having dedicated his talent, care and career to improving life for Americans.